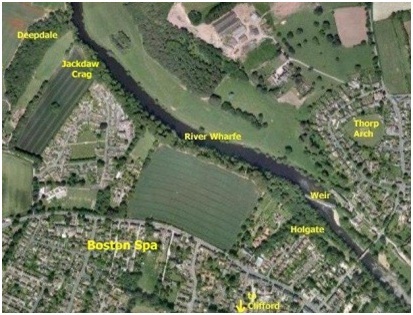 In 2008 Boston Spa Parish Council commissioned us to survey the area between Deep Dale and Holgate in order to help inform their management of the woodland along that stretch of the river. The survey focussed in detail on the archaeobotany of the hedgerows, woodland and ground flora. The report we produced also covered the sites with archaeological, geological and historical interest. The full report is now available from the group. The interactive trail will begin with a similar map to this. Forgive the delay, but we are preparing a new map covering a slightly larger area and more sites.